TSPSC will recruit 279 Posts in Telangana State Road Transport Corporation Junior Assistants Mechanical Supervisor Trainees Traffic Supervisor Trainees Posts Educational Qualifications Eligibility criteria Syllabus Examination Online Application Schedule will be anounced by Telangana State Public Service Commission in its detailed Notification Telangana State Public Service Commission (TSPSC) Junior Assistant (TSPSC) Junior Assistant required Education Qualifications Details: TSPSC notification to fill up the vacancies of Junior Assistant during the year 2017. Public Services – TR&B Department - Recruitment – Filling of (279) two hundred seventy nine posts in Telangana State Road Transport Corporation (TSRTC) through the Telangana State Public Service Commission, Hyderabad - Orders – Issued. 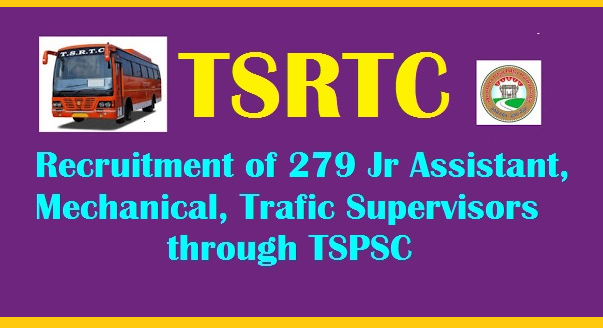 Public Services – TR&B Department - Recruitment – Filling of (279) two hundred seventy nine posts in Telangana State Road Transport Corporation (TSRTC) through the Telangana State Public Service Commission, Hyderabad - Orders – Issued. for Jr Assistant Posts: The Candidates must complete 12th class from any recognized board with minimum qualifying marks.See the official notification for more detail.